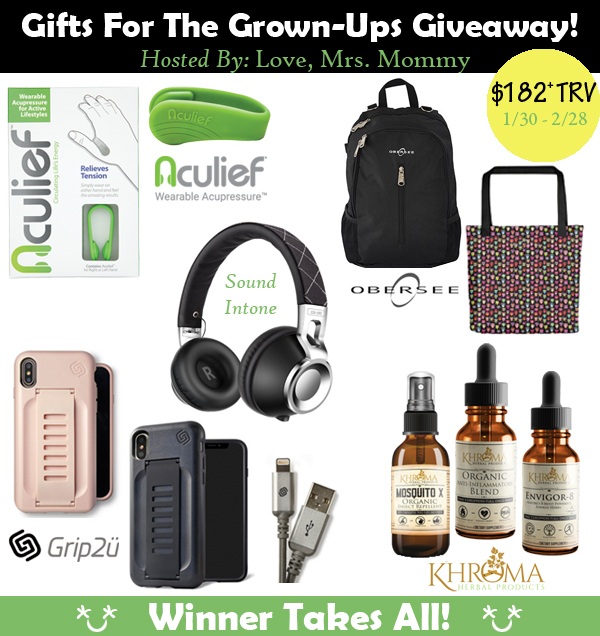 Welcome to our Gifts For The Grown-Ups Giveaway! We're working with a great group of bloggers to bring you this wonderful giveaway ~ 1 Winner Takes It All! Enter Today and Good Luck!! Winner's choice of in-stock iPhone cover (model and color) and USB cable. $49.94 RV! CX-05 noise isolating headphones with microphone in black. $22.98 RV! Aculief wearable acupressure - 1 pack. $29.99 RV! Winner's choice of any product. Up to a $30.00 RV! Winner will receive a $50 store credit. $50.00 RV!